The TSB|AWF and Eyes on Animals team returned, for the 4th time, to the yearly horse market in Skaryszew to evaluate whether anything improved since our inspection last year. Chances for change were good with a new Mayor elected last autumn and in February we gave a training course on the animal-welfare legal requirements to the local Polish officials responsible for overseeing the market. Day 1 starts for the team the night before: even though the market officially only opens at 5 am, we patrol the area all night to document how many livestock trucks carrying horses arrive too early. The situation is better than in previous years, the majority of vehicles arrive close to the opening time, avoiding that horses have to wait for hours on board. More horses are brought this year than last year: over 300, which leads to problems with having adequate space on the market for the animals. 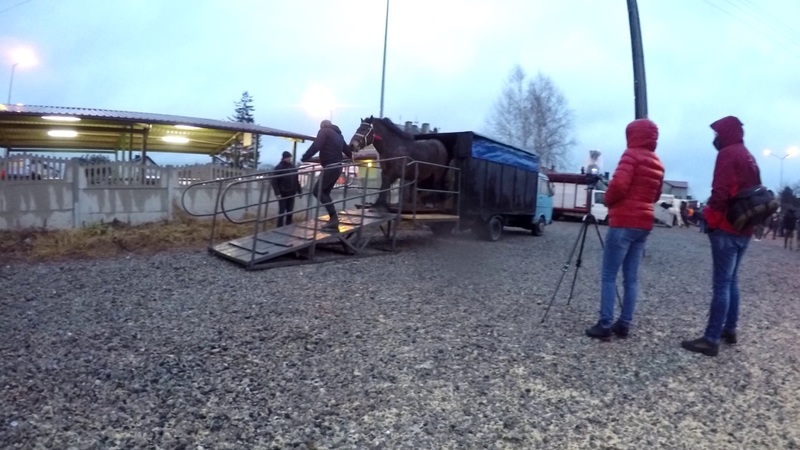 The organisers provide mobile unloading ramps for horse traders to use to unload their horses safely from the trucks, and we see them being used several times, however not all horse dealers are educated or patient enough to use them for safer unloading. We document two horses, forced down steep ramps without lateral protection, fall badly while being rushed out. Luckily the horses did not seriously injure themselves. The terrible weather is not helping: it is very windy and raining, with occasional hail and snowstorms. Numerous policemen are present, which does not prevent excessive alcohol consumption at the market grounds, despite the explicit ban. On the other hand, veterinary inspectors are much more willing to cooperate and have a new approach to inspect the vehicles with the use of checklists – this way our concerns can be immediately confirmed by competent authorities. All in all, we see some positive changes and some hope for the future on the side of the organisers, however it will take much more time to switch the mentality and bad habits of the horse dealers.